The 2018 East Coast Piers Race (ECPR) weekend was another success with 86 boats registering to take on the challenge of sailing 48 miles from Osea Island Pier to Walton Pier. The ECPR is a weekend of sailing held at Marconi Sailing Club (MSC) in Essex. It is held in aid of the Cirdan Sailing Trust and Essex Air Ambulance, with all money raised from the weekend going to support these charities and the vital work they do. This year the event also became part of the Allen Endurance Series – a 3-part event designed to test sailing crews and their equipment in contests of skill and endurance. attracting boats from across Europe. MSC’s reputation for the race has been bolstered by its hospitable approach – offering free on-site camping for the duration of the event, with many flocking to the site this year to take advantage of the glorious sunshine and to get their boats set up early. coming from the East and building throughout the morning. After a midday day race briefing, the first race kickstarted at 1pm, with the wind direction perfect for a course up the Black Water Estuary to Thirslet Spit and back to the club. Saturday racing competed with the impending World Cup England Football Match kick-off at 3pm, but sailing enthusiasts remained on the water, but were tested by lightening winds. Overall it was David Annan in his Musto Skiff who took the dinghy win and Grant Piggott and Will Smith who won the catamaran racing. The briefing for Sunday racing was held on Saturday and kicked off at 6pm. It drew-in a full marquee of competitor’s, all keen to understand the intricacies of the Sunday racing and the 3 races available to them: 48 miles (ECPR), 27 miles (Colne Point) and 13 miles (Bradwell). Competitors and their family and friends were well catered for, with a BBQ provided by MSC. Following this the ever popular Monkies Wedding Band did a great job of entertaining the crowds whilst they made their way through the beer kindly denoted by East Coast Piers Race sponsor, Mighty Oak who provided 7 firkins of beer (over 500 pints) with all beer being sold at £2 a pint and proceeds going to charity. The early morning call on Sunday came at 7am to get competitors up and ready for the planned 9.30am start. Competitors went through our ‘scrutineer’ gate to ensure they had the required safety equipment – a pre-requisite for participating in the race. The breeze was limited first thing. As a result, the race officer postponed the race for 45 minutes to enable the wind to fill it. Once on the water, it was tough keeping the competitors from crossing over the line with the tide but with support crews on hand ECPR began. At this point the race committee knew there was 10 knots of breeze at Walton and that it was building. The Colne Point race started 15 minutes later and was the race with the most sailors, this race is open to fast dinghies and catamarans and runs across a 27 mile course. Next to start was the Bradwell Race – this was introduced a few years ago to cater for more dinghies and the PY was adjusted to allow boats of 1030 or faster to attend. This year we were pleased to see a 29er and Contender taking part in the shorter course. Due to the wind conditions and the time the course was taking the ECPR and Bradwell courses were shortened. The ECPR turned at Clacton Pier and the Bradwell Race sailors didn’t do the additional dog leg back up river. In the ECPR race it was John Tuckwell and his crew John who took the line honours award. Mark Mawditt and his crew Tiffany took line honours in the Colne Point Rac. For Bradwell it was the 29er sailed by Sophie Johnson and Dylan who came through the line first. With Sail Racer supporting us with GPS tracking and with the support of Allen we were able to award some additional prizes based on the data collected from the boats. Prizes were then awarded for the fastest speeds on the courses and the fastest on corrected time. A raffle is also held over ECPR weekend with this years prize being a summer clothing package from key sponsor Zhik worth over £500. 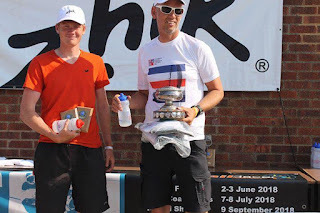 This year local sailor Kevin Kirby took the prize home – a massive thank you to Zhik who not only provided this prize but also donated lots of other goodies for the prize giving.